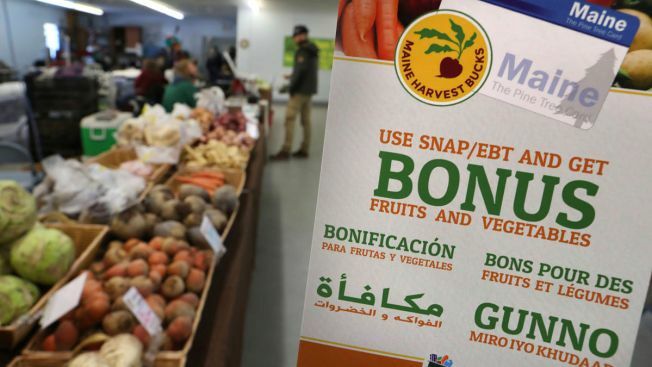 In this Friday, March 17, 2017 photo a sign advertises a program that allows food stamp recipients to use their EBT cards to shop at a farmer's market in Topsham, Maine. Millions of Americans could face going without the benefit that allows them to purchase food if the government shutdown continues into February, NBC News reported. The Supplemental Nutrition Assistance Program, known as SNAP or food stamps, costs an average of around $4.8 billion per month, according to the U.S. Department of Agriculture. But because of the government shutdown, the program has only $3 billion in emergency reserves for February. More than 19 million households in the United States receive food stamps, accounting for nearly 39 million people. Each household receives on average $245.28 per month. But because of the shutdown, USDA has no money to pay for the program in the ensuing months. The agency also had to furlough approximately 95 percent of Food and Nutrition Services, the office that oversees the SNAP program. The White House and the USDA did not respond to requests for comment about their plans to address the shortfall, but experts say there is cause for concern for the millions potentially impacted.